Today was such a busy day of errands that we didn’t even take time for lunch. At 3:00, we stopped at Jason’s Deli and ordered take-out of the soup of the day, along with one of my favorite sandwiches. I wasn’t sure the sweet potato and pork soup would be good, but I knew the sandwich of multigrain bread, roast turkey, philadelphia cream cheese, cranberry relish, onions and field greens would be great. We took our carry-out lunch home to relax and eat. 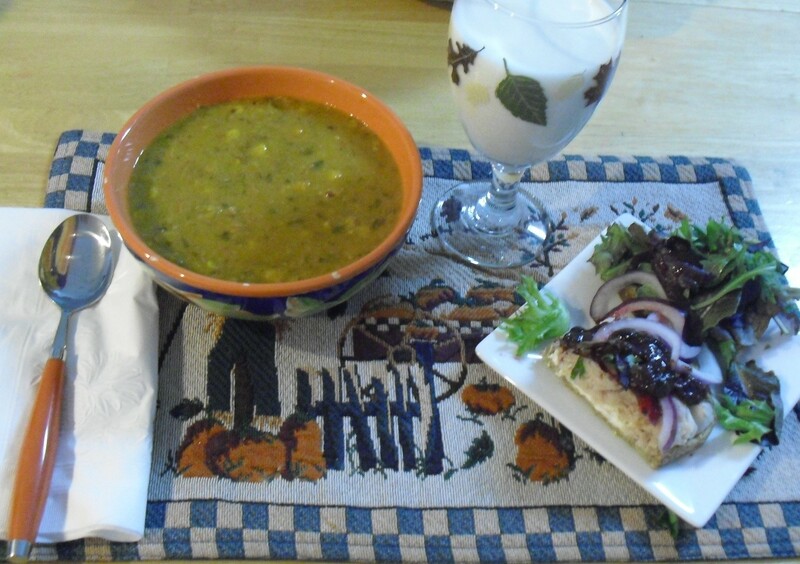 I added some of my raspberry mustard to the sandwich and sampled the soup. To my surprise, it was delicious… I mean Big D delicious. I imagined this tasty soup could be a good evening meal with leftovers, using sweet potatoes, blended with vegetable stock, left over shredded pork roast, spinach and onions. I would have to experiment with the spices to try to recreate it. When I was growing up, Mom prepared sweet potatoes often. She usually prepared some version of candied sweet potatoes, so my repertoire for using sweet potatoes was limited. WHEN I BEGAN COOKING in my own home, I made the candied version too, but less often, and in recent years, frequently serve baked sweet potatoes with a little butter and salt. I also roast them in the oven with other vegetables with some olive oil, salt and pepper … or cook them in the crock pot with pork chops, orange juice, onions, ginger, honey. WE COULD EXPECT TO SEE on Mother’s Thanksgiving and Christmas table, her sweet potato recipe that she called her “sinfully rich sweet potatoes” – and it was too. I don’t know where this recipe came from, but it has been a staple in the family for many years. Sure it had its share of calories, but it was the dish that some family ate for dessert, or even breakfast, if any was left over. I CHECKED MY FAMILY’s OLDER COOKBOOKS published from 1907 to the 1940’s and found no recipes for sweet potato soups. When I searched on the internet, I found dozens of recipes for sweet potato soups, with a wide diversity of ingredients. . They seemed to be grouped into savory soups with garlic, onions, celery, chicken stock using leafy tops of celery and other spices, milk… or with lentils and spinach… or curry and carrot. There are also slightly sweet soups with cinnamon, nutmeg and ginger, maple syrup, brown sugar. My daughter says she recently had sweet potato soup with coconut milk. THE VERSATILE SWEET POTATO is one of the oldest vegetables known to humans and is a major staple in many parts of the world. It was often quoted that Christopher Columbus introduced the sweet potato to America. DNA testing has produced other information, says Michaeleen Doucleff (www.npr.org/…How the Sweet Potato Crossed the Pacific Way Before the Europeans). There is compelling evidence that sweet potatoes originated in the western coast of South America. SWEET POTATOES ARE LOADED – and I mean really loaded with nutrients and vitamins – vitamin A and C, some calcium and iron, lots of fiber and low calories. The versatile sweet potato will surely find a place on my holiday tables… in various forms. WHAT IS YOUR FAVORITE sweet potato recipe? sue – Your lunch sounded heavenly. One of the things I miss the most about living on either coast is the creative soups and sandwiches created in deli’s. I particularly love sweet potatoes and often simply bake them and eat them plain (as a diabetic I’ve learned to enjoy them just as they come out of the oven). I canot eat meat (health issues) but my guess is tofu would make a great subsitute for the pork. My mother always made the sinfully rich swetpotato dish every Thanksgiving and Christmas and although everyone thought it was a necessary dish for the family table, thankfully it was never one of my favorites. I love sweet potatoes and yams any old way…soups, side dish, pie, bread, muffins. Yummmm. I think I’ll try your mom’s recipe. It sounds similar to my own mom’s, but she didn’t use coconut. Sounds good to me!